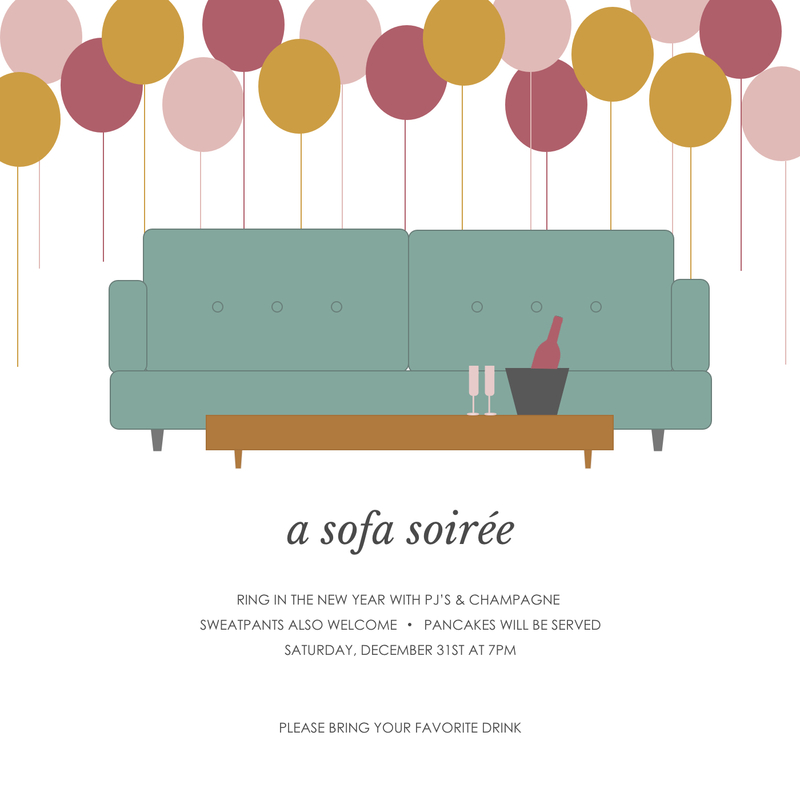 New Year’s Eve always has a way of sneaking up on me, yet I’m never able to resist hosting a last minute party for family and friends. Below you’ll find fool proof tips for a simple, fun New Year’s Eve Party as well as a free digital invitation you can send to your guests! Use what you have around the house. In a pinch, candles always make a space look more festive. Don’t be afraid to repurpose Christmas decor either. White lights are perfect for a New Year’s Eve look. 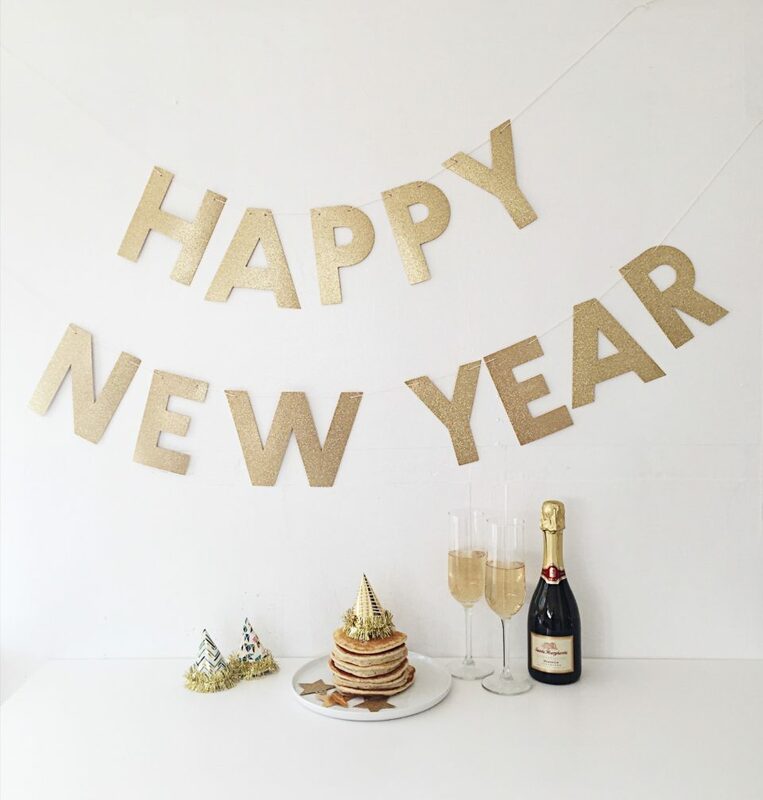 Grab a few sheets of glitter paper from your local craft store to make a New Year’s Eve banner. Cut the leftover pieces into glitter stars. Use this fabulous DIY to make gold party hats. Or paint these numbers for a simple “2017” display. Use white & gold balloons as a backdrop. Helium balloons are one of my favorite fast party hacks. Target almost always has this cheap helium tank available. Filling the balloons is quick and easy, and makes a big impact on the gathering space. Create a pancake bar by setting out different pancake toppings in bowls. 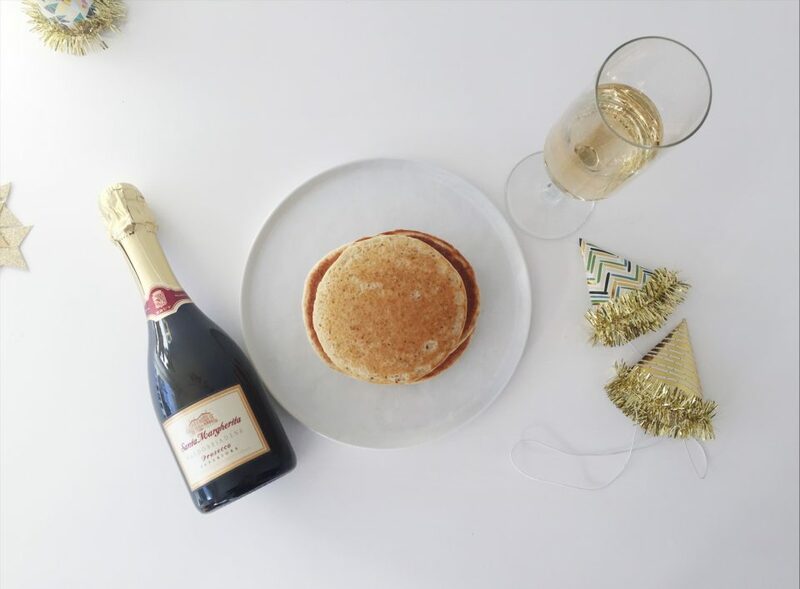 Dress up your pancake stack by adding a toothpick to your cutout glitter star. Champagne is a great BYO item for guests. Set out games to play. Pass the time until midnight with games your guests will enjoy. Go with classic board and card games, or find New Year’s Eve games online. Here’s one of my favorites. Plan how you’ll watch the ball drop before 11:55pm. Most cable news stations will broadcast live from New York City. However, if you don’t have cable make sure to find a way to stream the ball drop online. Somewhere along the way as our culture broke free from social pressures to entertain and get family dinner on the table by 5pm, we lost the habit of gathering. We let food become fast and convenient, cooking a necessary evil to outsource. It’s funny how that happens with change. We often swing wide in the opposite direction for a while, working so intensely to steer clear of past baggage and mistakes that we lose the goodness that thing had in the first place. The goodness, in this case, being the joy and downright holiness of the kitchen.